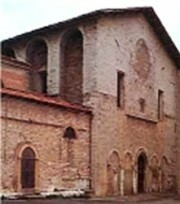 The Church os St. Peter, after having been enlarged by the Olivetanis which moved to the abbey in the 1505, has been completely modified. However, its facade maintains interesting architectonic trends which permit to formulate some realistic hypothesis on its origin. There are four columns, partially built-in, which originally supported an open gallery then demolished and later on used for the construction of the church, consacrated in the XI century. The columns are adorned with capitals badly preserved, carved into three overlapping circles of acanthus leaves, whose presence can be related to those byzantine tendencies which, in the sixth century, left other signs in the city. Small consoles are inserted in the facade, where fantastic animals and arboreal patterns have been carved, and give the basement to the arches supporting the gallery. After the deep change during the Renaissance age, the style of the temple is perfect, imposing, characterised by perfectly balanced architectonic elements. The church has at the inside some frescoes of Raffaellino del colle and Caravaggio disciples as well as carved and inlaid furnitures, most of which were worked by the Maffei brothers, artists from the region, of great value.